González, C.; Muñoz, F.; Roset, J. 2nd International Exergy, Life Cycle Assesssment and Sustainability Workshop & Symposium final conference of Cost Action C24. 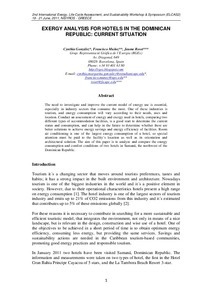 González, C.; Muñoz, F.; Roset, J. Exergy analysis for hotels in the Dominican Republic: current situation. A: International Exergy, Life Cycle Assesssment and Sustainability Workshop & Symposium final conference of Cost Action C24.. "2nd International Exergy, Life Cycle Assesssment and Sustainability Workshop & Symposium final conference of Cost Action C24.". Nisyros: 2011, p. 563-570.